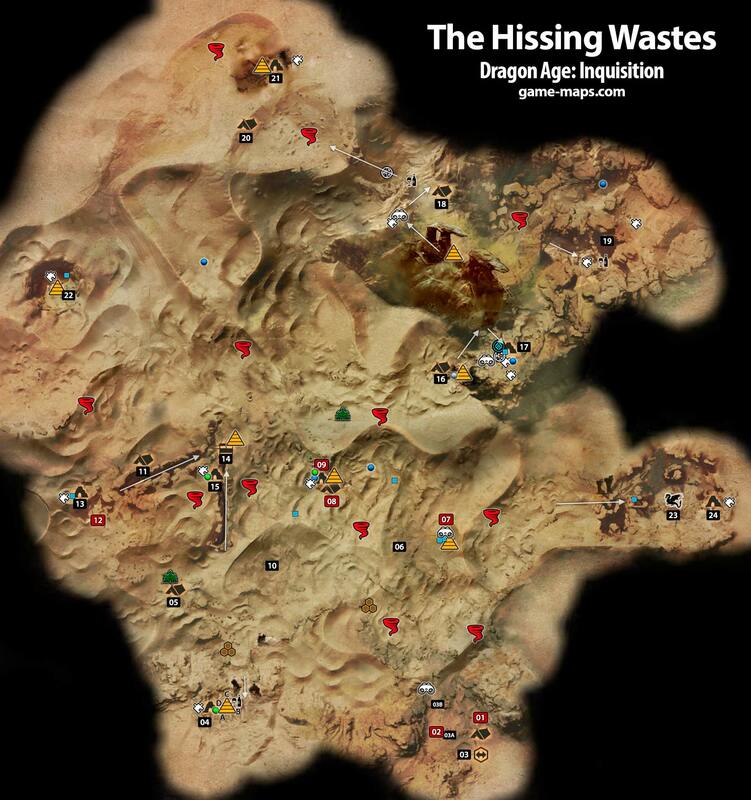 The Hissing Wastes - Dragon Age: Inquisition Walkthrough, Game Guide and Maps, with Quest and Locations of Camps, Merchants, Rifts, Ocularums, Astrarium, Dungeon Entrences, Landmark (POIs), Crafting Station, Mosaic Piece, Inquisition Agent, Secrets, Party Members, Bottle of Thedas and Codex Entry. QUEST: The Tomb of Fairel to find and open Tomb of Fairel you need 5 Key Fragments. Tomb of Fairel Key Fragment are in (04), (09), (15), (17), (21). Tomb of Fairel is at (24). NPC: Ghost Look for her again and talk to her on 03A and 03B and You will receive reward. "the ghost was not at those places......she spawns at random locations around the camp and the sand crags..."
To open Tomb Doors you have to light in correct order 4 Veilfires around. Read text near each veilfire before light it. First light your torch near sealed doors, Then go from A to D.
A - "Fairel's sons built monuments ..."
B - "And worked together ..."
C - "But each ruled differently ..."
D - "And where one brother fell ..."
QUEST: Notes on the Wastes You have to find 8 pages of A Jurnal on Dwarven Ruins (they are marked on big map as light blue square). The are secrets so use Search. ITEM: Padge There are 2 pages near this location. 1. "This is the tale of Fairel ..."
2. "Who against their father's wishes ..."
3. "For pride these halls ..."
4. "And for loss these halls ..."
1. "After many years Fairel ..."
2. "And with the burden growing ..."
3. "He bade each son swear he ..."
4. "And the brothers swore ..."
1. "The sun burned above oceans of sand ..."
2. "But in the sand was Stone ..."
3. "Fairel hewed the stone ..."
4. "And with his sons' help ..."
2. "The strife that destroyed thaigs ..."
3. "His own clan and two sons ..."
4. "The surface where they would hide ..."
To open this Tomb you need 5 Key Fragments.